Paralyzed By Polio, Georgina Mamba Thought She'd Never Get The Education She Craved : Goats and Soda She was paralyzed by polio. So why did her school put her in a class for the intellectually disabled? Then one for the blind. Then one for the deaf. Georgina Mamba's activism for people with disabilities brought her to the United States as one of 1,000 Mandela Washington Fellows under President Obama's Young African Leaders Initiative. Georgina Mumba wasn't blind. Yet when she was in the fourth grade she was kept for months in a class for kids who couldn't see. Then she was transferred to a class for the hearing impaired — even though Mumba wasn't deaf either. Mumba's problem: At age 2, she contracted polio and essentially lost the use of her lower limbs. And in Zambia, where she's from, the educational options for physically disabled people are extremely limited. 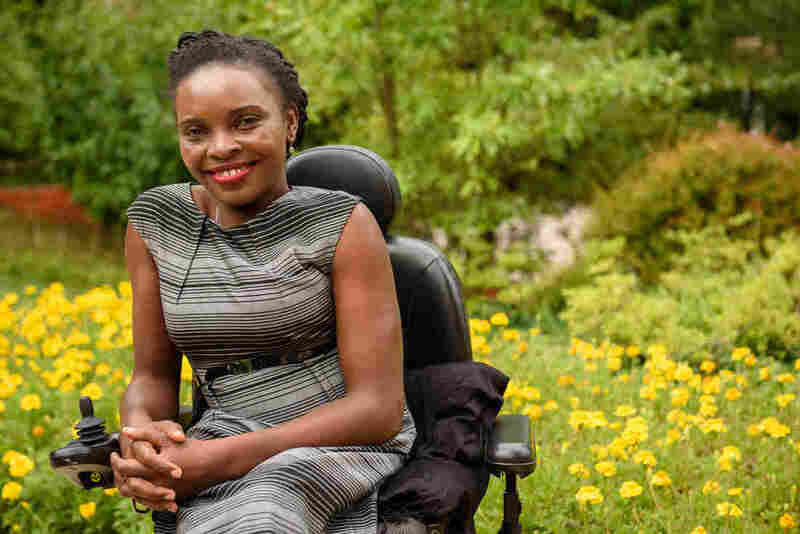 Now 36 and a statistician in Zambia's Ministry of Tourism and Arts, she's been speaking out about her remarkable path to success in hopes of opening the way for others who, like her, are living with a disability. From the start, she says, growing up as a child with paraplegia in Zambia's capital, Lusaka, meant having to contend with unpleasant rumors. "You know in Africa when you have eight siblings and you are the only disabled one a lot of people assume you are bewitched," she says. "So people believed this weird stuff." Mumba's parents never bought into that view. And they made a point of enrolling her in the local elementary school as soon as she turned five. Still, there were limits to the support they could offer her. With a large family to provide for, Mumba's father, who owned a small grocery, couldn't afford to buy Mumba a wheelchair, let alone pay for rehabilitation therapy to help her get around on braces. So each morning, Mumba's mother would carry her into the classroom and settle her at a desk. There Mumba would remain for the rest of the day — stuck while the other kids raced in and out for recess and activities. Sometimes a teacher would talk to Mumba, but mostly, she says, she was left alone. "When you're that kid that stands out nobody wants to associate with you. Nobody was hanging out with me," she says. "That little desk was my whole world. Looking back on it, it was almost a form of torture." The one upside was that Mumba became an excellent student. "All I had were books. Those were my friends. So I would sit there and go through my books, over and over," she says. Then, in the fourth grade, she was robbed of even that pleasure. Because of other demands on the family's time, it had become increasingly difficult for her mother and other relatives to carry Mumba around. So the family decided to send her to a boarding school for disabled children. "They were hoping that if I was in a special school with other disabled people I wouldn't be so isolated," she recalls. They soon discovered that in Zambia, such schools were generally just homes for disabled children who'd been orphaned or abandoned. Typically, says Mumba, they were run by faith-based groups that had limited funding and tended to add on the educational component as an afterthought — a way to keep the children occupied. Mumba's school divided the kids into three classes: one for those who were blind, one for those who were deaf or mute and a catch-all class for those with any other disability. Mumba was placed in that third class. She was the only child who didn't have an intellectual or learning disability. And some of those impairments were severe. "It was mind-numbing because the teachers did not have any expectations for these kids. There were no learning materials. We were told to just sit on the floor and try to copy whatever the teacher would write on the board. We were not even asked to commit it to memory. Sometimes it would be the same stuff on the board for weeks — a bit of math or a single word in English." Several months in, she recalls, "a teacher who was just randomly walking around the class looked at what I had been writing and saw my handwriting was quite neat. And it took him aback because he wasn't expecting that kind of neat writing in this class." The next day the school moved Mumba into a different class — the one for blind children. Academically it was a step up but only barely. "At least there was some learning," she says. "But I would not say it was high quality. It was like, 'Okay, these are abandoned kids. We don't even know if they have a future. So whatever books arrive we'll just use those.'" Mumba also had to spend time learning to read and type in Braille. "At first I was actually quite excited," she says, laughing. "I didn't realize this was really a distraction." A few months after that, Mumba was moved into the class for deaf or mute children — where she spent hours learning sign language. Mumba's parents moved her into another school for kids who weren't disabled. Once again, her lack of mobility left her isolated. It wasn't until the 7th grade that her parents found a school that actually fit her needs. This one was intended for children with physical disabilities. And it was run by Catholic nuns from an Italian order that, she says, got reliable funding from the Italian government. "For the first time in my life I felt like I was in an environment where someone was focused on my potential, not just on my limitations," she says. Academically, Mumba blossomed. "And I had friends! We never even thought of our disabilities. It was just me and my friends. We were more like a family than a school." She stayed through high school and went on to pursue college degrees in demography and economics. But when Mumba returned to Zambia after completing a master's in Australia, she was struck by how challenging her country remained for a person with physical impairments. In Australia she says, "I was really independent. All I needed was my motorized wheelchair." In Zambia she was once again beset by barriers. In 2012 the country had passed a law calling for ramps and other measures to make schools and government buildings and other facilities accessible to people in wheelchairs. "But the problem is implementation, implementation, implementation," she says. "Sure, you'll see ramps at every corner but most are these weird crazy ramps that a disabled person cannot actually go up." And there's more — she's found that across not just schools, but workplaces, churches and neighborhoods people still view disabled people as less capable and less worthy of respect. Since then she's been writing and speaking out in an effort to raise awareness among policy-makers in government — including at a TEDx talk in Lusaka last spring. "I'm just trying to use all my resources to make sure the word is out there," she says. "When people don't do the right thing it's not necessarily because they're bad people, but because they're ignorant. So the onus is on those of us who have lived the experience to inform them." This summer her activism brought her to the United States, as one of 1,000 Mandela Washington Fellows under President Obama's Young African Leaders Initiative. The program aims to support the region's next generation of ground breakers by bringing them together for six weeks of brainstorming, networking and training sessions in leadership and management skills. Now that Mumba is heading home she hopes to use the higher profile she's gained through the fellowship to bring more attention to her message. "I'm a statistician, trained in policy analysis, and a seasoned public servant. If even I'm experiencing exclusion then something is wrong," she says. "It's not just about ramps — we need to understand the meaning of inclusion in every sphere." What does inclusion look like? "For someone like myself, who's in a wheelchair, yes, let the building be accessible so I can get into the room. But also, when I come into the room, see me. See me for my strengths. Accept my limitations. But focus on my potential."